The U.S., a role model in the fight against slavery? At the end of March 2016, U.S. Customs and Border Patrol issued an order to seize any material imported into the US produced by the Tangshan Sanyou Group, a Chinese company, resulting in the confiscation of a shipment of soda ash. The agencies acted on information that the Group and its subsidiaries reportedly used forced prison labour to produce its merchandises. This was the first seizure of goods linked to forced labour in more than 15 years by US Custom officials, made possible by the Trade Facilitation and Trade Enforcement Act President Obama signed this February. This newly introduced Act closed an 86-year old loophole in the Tariff Act of 1930. While the Tariff Act gave Customs and Border Protection the authority to seize shipments suspected to be produced with forced labour and to immediately block further imports, overall the Act was only applied 39 times. This was due to a loophole allowing import of any products, regardless of their production conditions, if domestic supply was insufficient and the product was required to satisfy domestic demand. This made it impossible for 15 years to enforce the law against any type of goods linked to forced or child labour. This seizure by one of the world’s largest consumer markets is a ground-breaking development in the global fight against forced labour. By effectively applying the new law and seizing the shipment on the grounds of forced labour linkages, the US sent a strong signal to producers around the world that their production conditions matter and that their supply chains need to be cleaned of labour abuses. For the past years, EJF together with other organisations has demonstrated the widespread existence of forced, bonded, slave and trafficked labour in Thailand’s fisheries and seafood sector – for which the US is a key export destination. In 2013, Thailand exported approximately US$ 7 billion worth of fish and seafood. Of these products, 22.8% went to the US. The EU issued Thailand a yellow card as a warning of potential trade sanctions for the country’s failure to adequately monitor and control its fisheries. Thailand has also repeatedly been classified as a Tier 3 country in the US State Department’s Trafficking in Person’s report. 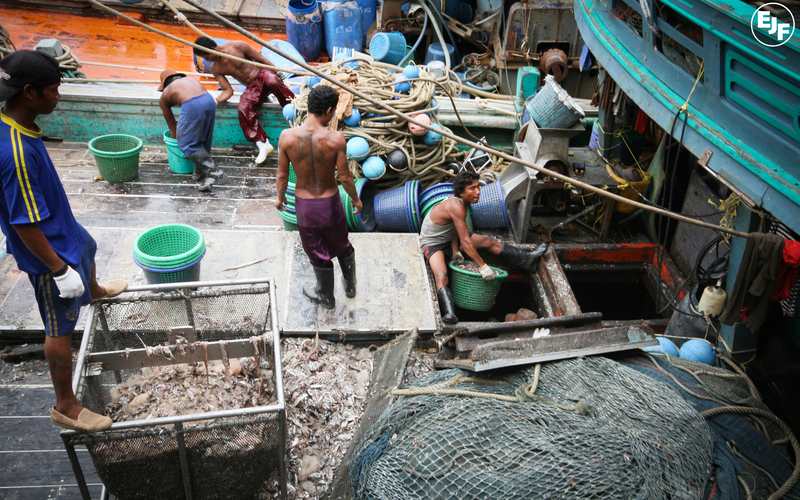 Our most recent report ‘Thailand’s Seafood Slaves’ documents how slavery and trafficking continue to remain at the core of Thailand’s seafood economy. It is about time that Thai seafood produced by slaves and imported to the U.S. receives the same treatment. Only such action will demonstrate to suppliers in Thailand that they need to radically change their production conditions and to immediately address any labour issues in their supply chains. It now needs to be ensured that it finds consistent and unconditional application in all product sectors proven or suspected of having links to forced and slave labour. Further strengthening consumer awareness and highlighting the impacts our consumption patterns are having on the life’s of vulnerable people around the world will be key conditions to achieve an end of global slavery.